Many individuals who are trying to lose weight have heard anecdotes and stories about common individuals and celebrities who used hypnosis to shed the pounds. But does hypnosis really promote weight loss? Are there credible case studies of instances where individuals lost weight and keep the pounds off as a result of hypnotherapy? According to this ABC news report, there is a very credible case involving a mom who lost 140 pounds following hypnotherapy sessions. The subject in this case study, 35 year old Julie Evans, who admits that she was a skeptic when she first embarked upon her weight loss journey. The mother of two weighed in just short of 300 pounds at her heaviest. She blamed her weight gain on her pregnancies and depression. Evans, a stay at home mom, set out to lose weight after she had a realization while on vacation in Hawaii in 2006. She realized that she was too ashamed and embarrassed to wear a bathing suit, and she missed out on a scuba diving trip as a result. It was this experience – and the realization that she was missing out on opportunities and experiences because of her weight – that sparked her desire to drop the pounds. A resident of Macomb Township, Michigan, Evans was an avid fan of junk food, fast food and other unhealthy fare, so changing her diet was a major undertaking – and a very difficult one. At first, she was going to utilize a traditional approach to weight loss, but then, her mother encouraged her to try hypnotherapy. A skeptic, Evans attended a seminar with Florida hypnotherapist Rena Greenberg and it’s a decision that would transform both her body and her life. Weight loss hypnotherapy work to re-wire the brain of the individual to eat healthy, nutritious foods instead of high-fat, high-calorie processed food. Using hypnosis to lose weight is still not a mainstream technique – most still focus on diet, exercise and in extreme cases, gastric bypass surgery – but it’s an approach that’s gaining popularity as anecdotes such as this one gain mainstream attention. Stated simply, hypnosis for weight loss allows the subject to re-program their brain to crave healthy foods rather than junk food. Critics say that people who undergo hypnosis are actually just harnessing the power of suggestion, which when combined with a strong desire to change, allows them to achieve their goals of weight loss. But one-time skeptic Julie Evans believes it’s much more than that. All I wanted was spinach. I wanted salad. It was the creepiest feeling in the whole wide world… I would pause and think about what I’m putting inside of me,” Evans explained in an interview with ABC News, adding, “It worked for me. But I do think you have to have an open mind and be willing to listen. According to Greenberg, hypnotherapy provides the individual with a way to rewire the mind in a manner that allows them to overcome old, harmful habits using visualization and hypnosis. She instructs clients to visualize themselves opting for a workout instead of a snack or pushing a plate away because they’re full. Clients like Evans report that just a single hypnosis session brought results and numerous scientific studies have revealed that the individual must believe that the approach is going to be effective in order to see real results. But for Evans, the results are undeniable. A weight loss totaling 140 pounds is quite significant and it lends credence to the claim that “hypnosis gastric bypass” can, in fact, be very effective in some individuals. Many hear about the term ‘hypnosis’ and they think of quack medicine, perhaps envisioning a swirling black and white spiral or someone sitting in a trance as the hypnotist rhythmically swings a pocket watch swings back and forth. But hypnotherapy is a very real and effective method for transforming our mind and behaviors. Hypnosis can help one lose weight by transforming our mind on a subconscious level. To understand how and why hypnosis works, one must understand that our mind is comprised of two parts: a conscious mind and a subconscious mind. The subconscious mind is the part of our brain that is involved in dreaming. This part of our brain also holds many beliefs and can even be conditioned, spurring us to perform specific behaviors or acquire particular habits or tendencies. These deeply seeded beliefs and opinions that dwell within our subconscious mind are problematic because they’re very powerful – more powerful than our conscious mind. This can lead to a battle within our mind as one strive to lose weight and ultimately, the subconscious mind wins the tug of war. As a result, you give up on your diet, stay home and snack instead of going to the gym or give in to cravings for foods that only serve to perpetuate your bad eating habits. But through hypnotherapy, we can condition our subconscious mind to over-write its views and relationship with food. This makes it possible to eliminate cravings, reduce hunger and avoid so-called emotional eating because we’re changing the part of our mind where these thoughts, beliefs and feelings arise. If your subconscious mind supports emotional eating, dreads exercise or spurs cravings and other unhealthy eating habits, no amount of dieting, exercise or weight loss products will bring about permanent, lasting change. At best, you may lose some weight in the short term, but as soon as the ‘diet’ ends, you’ll return to your unhealthy eating habits and the weight inevitably returns. These approaches are a bit like applying a band-aid on a wound. Hypnotherapy for weight loss brings long lasting results because it’s more like healing the wound, thereby eliminating the need for a band-aid. 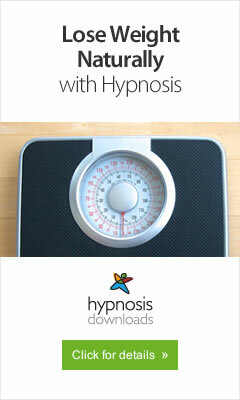 Hypnosis is particular effective for weight loss in cases where an individual engages in emotional eating. Many individuals turn to food as an emotional band-aid or as a comfort mechanism. Emotional eating isn’t about hunger; it’s about the experience of eating. The food symbolizes a source of comfort and nurturing. For some, the emotional eating is rooted in childhood trauma or negative experiences that occurred during childhood; others develop emotional eating habits as an adult. Hypnotherapy enables the individual to identify the source of the emotional eating and you can re-program your subconscious mind to overcome that particular tendency. Hypnosis is also very effective for those who view food as an addiction of sorts, experiencing intense cravings. For these individuals, hypnotherapy is effective in identifying the role of food in the person’s life and the subconscious mind is reprogrammed in a manner that promotes healthy eating and a healthy lifestyle. Use this hypnosis pack to re-train your brain and lose weight naturally – without counting calories, complex menus, or special workouts. Hypnosis is used to address a wide range of different problems, from weight loss and bad eating habits, to fears and phobias, addictions and even obsessive-compulsive disorder. Many dismiss weight loss hypnosis as a fad or quack medicine, but the scientific research into this form of therapy has revealed something very different: hypnosis is a very effective method for weight loss in many individuals. One study (Effectiveness of hypnosis as an adjunct to behavioral weight management – Journal of Clinical Psychology, 41, 35-41) revealed that 41% of individuals who used hypnotherapy for weight loss achieved or exceeded their weight loss goals, compared to just 11% in the other group, which underwent behavioral conditioning. A follow-up evaluation at the two-year mark revealed that the study participants who had utilized hypnotherapy had a significantly higher rate of success in continuing their weight loss after the conclusion of the study and maintaining a healthy weight in the long term. Studies have also revealed that hypnotherapy is very effective both as a stand-alone method and when used in conjunction with other treatment approaches. An individual’s suggestibility had a tremendous impact on the efficacy of hypnotherapy and their overall degree of hypnotizability. Another study (Hypnotizability as a factor in the hypnotic treatment of obesity – International Journal of Clinical and Experimental Hypnosis, 33, 150-159) was performed with 30 men and women who received hypnotherapy over an eight-week period. They were taught to self hypnotize and they were instructed on how to perform post-treatment regime that was designed to maximize success. An assessment was performed at the 12-week mark revealed that the average study participant had shed 20 pounds in 12 weeks! They also found that there was a significant correlation between an individual’s hypnotizability (determined in an objective manner via the Stanford Hypnotic Suggestibility Scale) and their weight loss. Quite simply, those who were more suggestible saw more dramatic results. Hypnotherapy works to change the way in which your mind works, enabling you to cut out the cravings and eliminate bad eating habits and other negative behaviors that promote weight gain or harm our overall health. As a fitness professional for over a decade, I have seen that at least 75% or more of lasting weight loss is mental. The right action plan is important, but without the motivation to follow through and make that lifestyle change, it won’t work. That is why most people gain the weight back. Very interesting post. Thanks for sharing! This is very interesting, I can’t say I would use this as I’m worried about people affecting my thoughts past the weight loss, but this still seems like a great idea for those that want to try it. Weight loss really takes place in the mind so if someone can convince you to lose weight and your mind is convinced of it, I say go for it! I am a very busy mother, and I have very little time to exercise. If I did have time, I probably wouldn’t feel right about something like this, but I think that it could be a great option for me. Having so little time for myself, I rarely think for myself; this allows me to slip into habits that I would usually evade. From your description, I think that hypnotherapy would help me considering it is more of a mental thing than anything else.